The Barber National Institute received two separate donations of $13,200 and $5,000 from Home2 Suites and the Patel Family for the Barber Foundation on Monday. 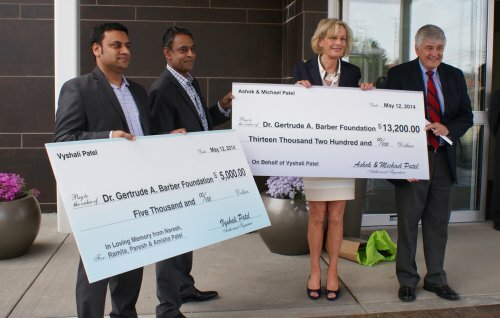 Paresh Patel, senior vice president of Chase Hotel Group, and Michael Patel, chief operating officer of Chase Hotel Group, were on hand to present the two checks to the Barber Foundation. The check for $13,200 came from Home2 Suites, which donated $100 for each day of construction since January 1. The hotel has since opened and is ready for stays. The $5,000 check was made in memory of Vyshali Patel, a former student at the Barber National Institute. The Barber National Instiute appreciates the generosity of the Patel Family and Home2 Suites and thanks them for their generous donation.